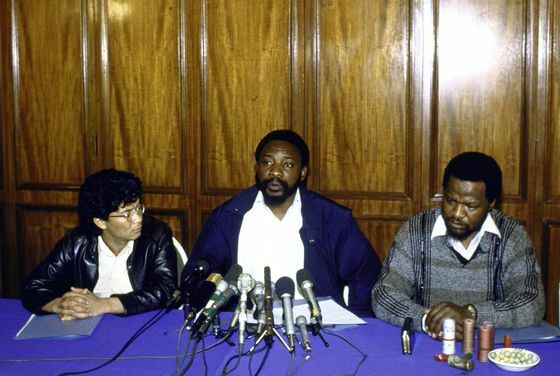 (Bloomberg) -- In 1987, an anti-apartheid firebrand named Cyril Ramaphosa led South Africa’s biggest-ever mining strike. Some 300,000 miners—from a union Ramaphosa himself had founded—walked off the job, protesting pay and working conditions. The mining company “used fascist methods to destroy workers’ lives,” Ramaphosa declared. Over the three-week strike, nine people were killed, 500 were injured and more than 50,000 were fired. Still, it demonstrated the power that organized black labor could exercise and the economic damage it could inflict on South Africa. Some analysts call it his “Thatcher moment,” a reference to the then-British prime minister’s defeat of the country’s powerful labor unions, which set the U.K. economy on a decades-long growth path. “He wants to move the power to the middle, he wants to reduce the power of unions in a party that is in an alliance with the unions,” said Nic Cheeseman, a professor of democracy and international development at the University of Birmingham in northern England. “Thatcher didn’t care about losing the support of the unions because she never had it.” In that sense, Ramaphosa’s task might be more akin to that of Labor Prime Minister Tony Blair, he said. The state power utility has 66 percent too many employees, according to the World Bank, while the 1.2 million-strong public service absorbs 35 percent of the budget and the teachers’ union exacerbates a dysfunctional primary education system that the World Economic Forum ranks 116th out of 137. Labor reform is key to the success of Ramaphosa’s plan to lure $100 billion in investment over five years. At the heart of the president’s problem is the intertwined nature of the ruling party and the union movement, which fought side-by-side to end apartheid. Since Nelson Mandela’s African National Congress won the country’s first all-race elections in 1994 it has governed in an alliance with the South African Communist Party and the Congress of South African Trade Unions, or Cosatu, the country’s biggest labor group. While the ANC has long advocated an economy mostly guided by orthodox economic policies, its union allies remain steeped in the Marxist-Leninist dogma that informed many of the protest organizations. The result: A constitution that gives workers some of the strongest rights in the world. 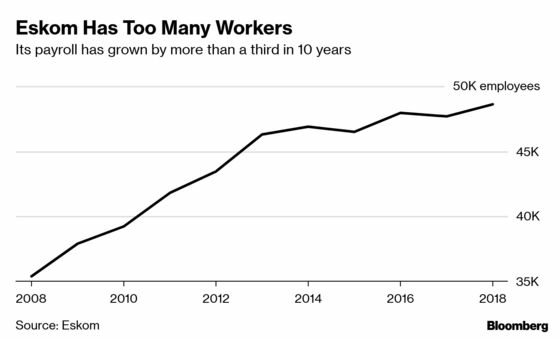 That helped raise union members out of poverty, but labor laws also make it difficult to dismiss staff and boost worker costs above those of other emerging markets. While Ramaphosa has been criticized for taking too slow an approach to reform, he has fired and replaced the boards of state companies including the power utility, Eskom Holdings SOC, and boosted the power of the prosecutorial services to tackle graft. The slowness is due to his meticulous style and his training as a lawyer, said Richard Calland, a founding partner of The Paternoster Group, which advises on political risk. Ramaphosa was to meet Monday with the leadership of the NUM, Eskom's biggest union, to discuss plans to split the state power company into three units, a move the labor organization fears will lead to job cuts. The union noted the meeting on its Twitter account. The president’s task is complicated by the fact that he must fight an election on May 8. He’s likely to save major policy battles until after that, especially given that he inherited the presidency last year after the resignation of Jacob Zuma. Winning an electoral mandate will strengthen his hand and that of the ANC, allies say. But a poor showing, even in victory, would weaken Ramaphosa’s standing in the party and his ability to make unpopular decisions. The ANC slumped to its worst-ever performance in 2016 municipal elections, securing 54 percent. Ramaphosa himself won control of the ruling party in December 2017 by the narrowest of margins as Zuma backed his ex-wife, veteran politician Nkosazana Dlamini-Zuma, for the post. 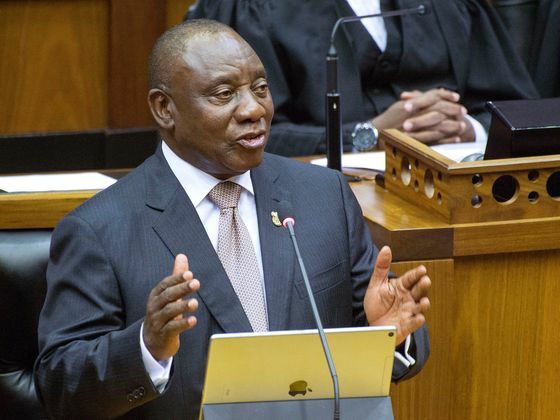 In his state of the nation address on Feb. 7, Ramaphosa spoke only of the need for a “pragmatic and cooperative relationship” between the government, unions and the private sector. He also announced a restructuring of Eskom and an early retirement program for state workers. 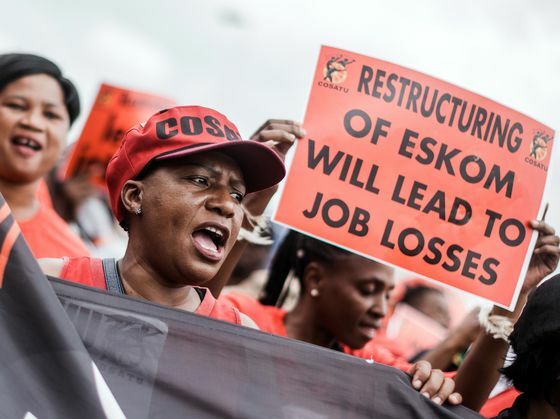 The backlash was swift: Cosatu staged nationwide protests over potential job losses on Feb. 13. The biggest union at Eskom later said it would shut down the utility for a week right before the elections to protest the plan. The government has folded to union pressure at times since Ramaphosa took power. When Eskom’s board last year said pay wouldn’t be increased because of the company’s financial problems, which include $29 billion in debt, workers protested and some sabotaged power plants leading to electricity outages. Public Enterprises Minister Pravin Gordhan intervened and Eskom agreed to boost pay by an inflation-busting 7 percent—and even more for the next two years. Ramaphosa also faces a divided and competitive labor movement. In 2014, the National Union of Metalworkers of South Africa, an industrial union, took its 340,000 members out of Cosatu. Meanwhile, the Association of Mineworkers and Construction Union has rapidly risen to challenge the NUM. Bheki Ntshalintshali, the general secretary of Cosatu, said he believes Ramaphosa “has a background and better understanding of the problems a trade union faces,” but the president’s post-union career is problematic for him in his relations with labor unions. Ramaphosa’s business career has included a coal-mining venture with Glencore Plc, running the South African franchise of McDonald’s Corp. and the chairmanship of some of the country’s biggest companies. As president, he has distanced himself from his business activities, selling some and ceding management of others, but he still has a fortune of several hundred million dollars, according to Forbes. A violent incident in 2012 also hurt Ramaphosa’s labor credentials. He was accused by unionists of instigating the massacre of 34 mineworkers by police at Marikana mine, which his company co-owned with Lonmin Plc. He has denied the allegations. But something will have to be done. Eskom is struggling to keep the lights on, the country’s sole remaining investment-grade credit rating is at risk, unemployment hovers at 27 percent and growth in 2018 was a paltry 0.8 percent.